This book is presenting the story of the rise and fall of the Moscow State Jewish Theater (GOSET) during the period of Stalin's terror, and of the fate of eminent Soviet Jews who just a few years after the WWII, in 1952, were executed. All this. 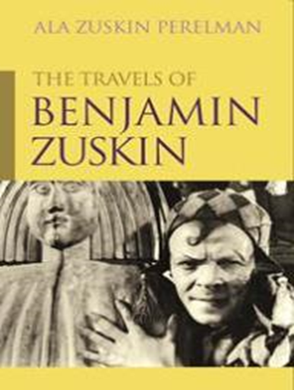 through the Benjamin Zuskin's personality which does focus the main traits of his profession, epoch, and people. The first part’s chapters are titled Acts as in a play, both because the hero was an actor and because the events in his life, external and internal alike, unfolded like a classical drama, until the final scene. Such a scene was never conceived in the mind of any playwright. Neither were conceived the “scenes” of KGB interrogations and in-trial testimonies: fragments of their authentic transcriptions were used, with no Author’s comments, as Interludes between the Acts. There are also Prologue and Epilogue. The second part consists of Zuskin’s few writings and some personal letters. Prologue. At the beginning, Zuskin as Reb Yekl in the production Freylekhs sweeps after him along the dancing crowd; he flies, he soars into the air, like the flying figures of Chagall. The Prologue ends with mention of Zuskin’s illness and arrest. Act One (1899-1920). 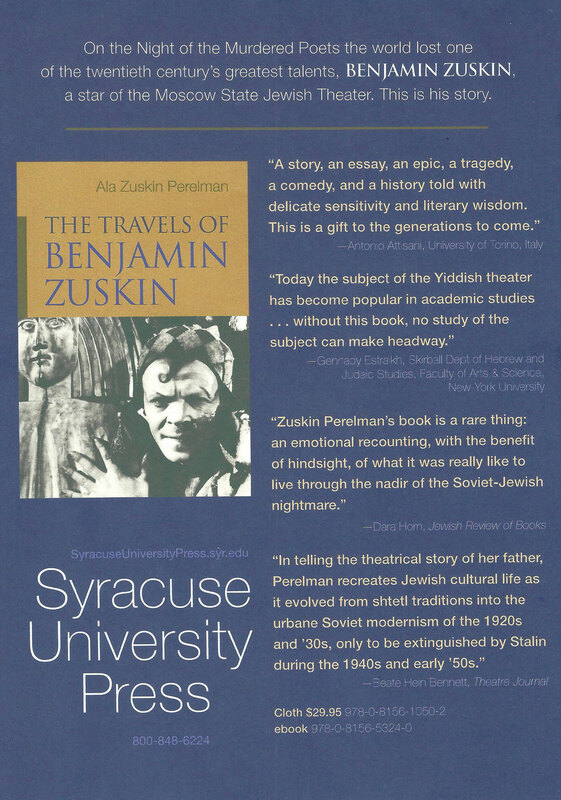 Zuskin’s childhood and boyhood on the background of WWI and Russian Revolution; dawning of his love for the theater. Act Two (1921-1928). Move to Moscow. Acqaintance with Granovsky and Mikhoels (the consecutive artistic directors of the Jewish Theater during the years to come). Admission to the Jewish Theater. Description of Granovsky’s modern theater techniques. Start of Zuskin’s usual situation: combination of a lack of self-assurance with accolades earned. The first great success: The Sorceress. The production 200,000: birth of Zuskin’s famous transitions – from parachuting with an umbrella, a dancing gait etc, to an expression of bitterness and pain. A pinnacle of Zuskin’s onstage achievements: Senderl in The Travels of Benjamin the Third by Mendeli Moykher Sforim. In the book is underlined the uniqueness of this role and of the duo Mikhoels-Benjamin and Zuskin-Senderl. This was not their first performance on the same stage, but previously they had never been so cohesive, so united, so perfect, and so indescribably impressive in their perfection. This duo runs through the whole book. And through their lives. “Together they jumped, danced, wept, and laughed… and together they aroused in the spectators the same joy and the same sadness”, wrote their common friend the artist Alexander Tyshler. “The destiny that embraced Mikhoels and Zuskin and led them on the path of their artistic life, this destiny, shared and tragic, did not relax its embrace until their terrible death” (p.190). Depiction of the tremendous success of GOSET in Europe followed up with instructions and comments from Moscow. The book emphasizes that the company was compelled to return to Moscow before the planned term of their tour was expired. Act Three (1929-1938). Description of the new period in GOSET – with Granovsky’s staying in Europe, Mikhoels becoming artistic director, authorities demanding modernism and grotesque be abandoned, and Soviet repertoire be produced – and of frightening atmosphere of prosecutions and purges in the country. The text seems to be less appealing because the subjects become too oppressive. All of the same, the book’s text resuscitates together with GOSET who manages to overcome the difficulties and to take the middle road, producing Shakespeare's King Lear. Detailed description of this production, a description, peppered with allusions and associations related to the past the present and the future, as well as of its contribution to GOSET’s long-lasting fame. With this, in the book are hidden neither relevant doubts nor premonitions: “The wave of the King’s scepter and the jingling of the Fool’s bells herald the beginning of the end” (p. 80). Here is also underlined that Mikhoels and Zuskin were to be treated as the King and the Fool so many times that the term ‘the King and the Fool' would cling to them; under this title they would anthologize articles and studies of the two actors and their fate, as well as the fate of their theater and of Soviet Jewry. This act does also present Zuskin as a cinema star and a teacher in Jewish Theatrical School. Act Four (1939 – 1947). In this Act, there is a lot of everything – GOSET’s jubilee, Zuskin’s awards, interesting accomplishments in GOSET, in theatrical school, in the field of variety shows, in cinema, Zuskin as an actor, , a stage director, a teacher. There is a lot of destiny, too – the war, the evacuation from Moscow to Tashkent, the establishment of the Jewish Anti-Fascist Committee. The membership in the latter was to cost to Zuskin his life, not in this Act, however. But in this Act, the “destiny” starts gradually prevail over the “everything”, if not par the number of pages but par the growing sense of anguish. Onstage, the most important roles were Hotsmakh in The Wandering Stars upon Sholem Aleichem (named theatrical wonder of the 1940s), and Reb Yekl in the highly awarded production Freylekhs by Shneur. Act Five (1948 – 1952). It starts with the funerals of Mikhoels who was murdered, ostensibly in a car accident. From here, up to the middle of this Act – Zuskin’s mourning and fears, his becoming artistic director of GOSET, productions where he played or which he staged, his illness and his arrest. All the second half of the fifth act is dedicated to the description of Zuskin’s interrogations in KGB’s prison, with retreats, explanations and assumptions, of course. The last sentence in this act is, as follows: “There is no man who has power over the spirit to imprison the spirit” (Ecclesiastes 8:8), (p.241). Epilogue. Actually, the text here presents the abridged transcription of the Zuskin-related-part of the trial of the Jewish Anti-Fascist Committee members, the indictment and the death warrant. However, the end of the epilogue is cheerful. The same Reb Yekl (Zuskin in the production Freylekhs) who in Prologue "flies", here floats from one end of the stage to the other. He extinguishes the candles put on in memory of Shoah victims, and before he announces the beginning of a wedding which is the symbol of life, exclaims: “Blow out the candles! Blot out the sorrow!” (p. 247).